two of my friends died in a freak mountaineering accident over the weekend, while typhoon frank lashed out on the islands with unmitigated fury. at around noon on sunday, jhoana pimentel, a former colleague at baker & mckenzie, and thaddeus reantaso, a fellow 2k5er, were swept by the rapids of a stream that turned into a raging river with typhoon frank's assistance. they were already on their way home when it happened. jhoana's body was found early monday morning, while tads's remains were identified by his father at the hermana mayor island, in the town of santa cruz, nearly 90km away from pundaquit in san antonio, zambales only a few hours earlier. it's tads's birthday today. the stream that took away my friends also claimed the life of another climber, and severely injured another friend. you might ask how is it possible for me to write about two friends dying while pursuing an activity that i am most passionate about with such distance, it almost sounds clinical? my response would be: how else can one deal with these tragic events? when i first heard that members from my club went missing while i was enjoying the overly generous welcome of the town of daet in camarines norte, i was only slightly concerned. i cared, for sure, but i was confident that they'd somehow survive. when we climbed kalinga in 2006, and were disconnected from the rest of the mobile world after typhoon paeng tore down towers and communication lines, we were also reported missing and a search and rescue team was being organized. we were far from missing, most certainly, and i thought the situation in zambales might not have been entirely different -- i have crossed that stream three times myself, so i didn't worry. until i received more devastating news later that day. i was overcome with emotion, and i began asking questions. i have been climbing mountains for 4 years now, and have faced very real risks and dangers that could have very quickly snuffed away my life, but i have always survived, and lived to tell embellished tales of adventure. so i began denying the facts behind the messages i continued to receive beginning monday morning. it just cannot happen to anyone i know. it just cannot. i know these people. i have climbed with them. i have taken pictures with them. i have downed many bottles of beer, shared many stories, heard their complaints, offered encouragement, with them, for them. they belong to this imaginary sphere of immortality that i have built around myself. mountaineering deaths have happened, and i have myself been part of a long weave at one time in the past. but they are always vicarious, not so intimately connected to me, in a way. we've never underestimated a mountain. that's how it is. but this is different. death has invaded a territory that the members of my club have guarded with jealous pride. in the 25 years of the amci mountaineering club, no one has died during a climb. we have, above all else, always emphasized safety. and yet despite the principles that we hold on to, nature's wrath is always more powerful, that even the slightest disregard for its might will most definitely result in dire consequences. my parents now have more cards to persuade me from going to the mountains. but i continue to ask questions, and in my search for answers, i begin to conjure stories. i have asked myself, and others as well, why this even took place. why did they take the risk? why did they not use ropes? i could go on asking many more why's and how's and who's. but finding blame in someone neither paves the way for healing, nor does it take us closer to acceptance. so that is why the tone of this entry isn't grieving. i choose to remember the great lives lived by jhoana and tads. i remember jhoana's mousy voice asking how far away we still were from the campsite during our last climb together up mount napulauan last april 2008. i remember tads's refusal to imbibe the shot of vodka while we fought freezing temperatures just below the summit of mount pulag. i choose to remember them this way, and i don't even have to try too hard to hear them laughing. my mountaineer friends have reached their summits. while i continue my journey, not knowing how far, or how near i am from my peak. 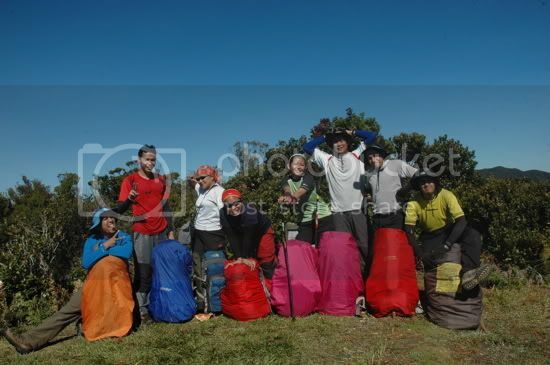 i'm glad that at the very least, i was part of their treks and that they were also part of mine. along the trail in kibungan. tads is second from the left, between dyake and janz. 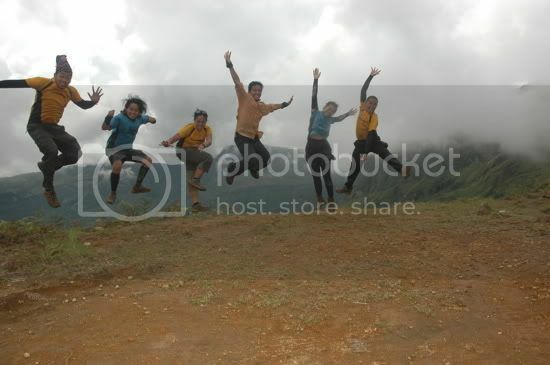 on the summit of mount napulauan. jhoana is fourth from the right, sandwiched by cecil ( miraclecello) and janz. i'm sorry about your friends. they had a fun and adventurous ride with life. I believe that's important. Pero ingat ka rin sir sa mga adventures mo ha. Take care. thanks. alam ko naman na nabuhay silang masaya. medyo naluluha ako habang inaalala ko ang mga oras na magkasama kami. pero kailangan magpatuloy ang buhay, at alam kong wala silang mas nanaisin pa kungdi ang ipagpatuloy ko ang nasimulan naming masasayang mga araw.